Don began making a living by selling his landscape photographs in front of Macy’s and began to receive recognition for his craftsmanship. His style was heavily influenced by the legendary photographer Long Chin-San and his technique of layering negatives. By taking three negatives, foreground, middle ground, and far ground, and selecting a subject from each negative, Don would form one composite image of a serene landscape. All the various scenes in an image existed in reality, but each uniquely handcrafted photograph in its entirety is a concoction of the artist's imagination. Each photograph was assembled only by the artist himself thus he never had an assistant nor a master printer like some photographers. His work has won scores of international awards and has been collected worldwide. Sadly, Don passed away in San Francisco in 2004. Don was born in Canton, China in 1929 and spent most of his life in Vietnam. As a young boy in Saigon he apprenticed at a photography studio. When he was not at the studio, he traveled and took photographs of the landscape. He stayed in Vietnam through the war, but fled by boat to California in 1979. He lived in San Francisco’s Chinatown where he had a small darkroom to create his photographs. While living the US he returned to China every few years to make new negatives. Only in the last few years of his life was his work discovered by a wider public, and he was kept very busy making prints for collectors across the US and elsewhere. Don died in June 2004. 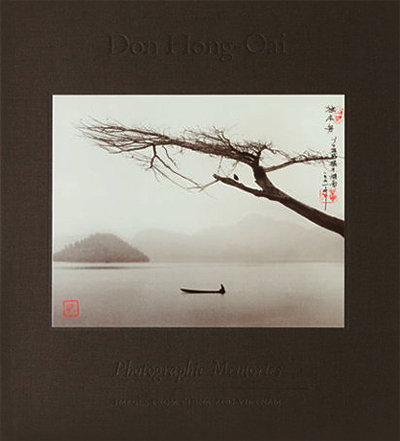 The photographs of Don Hong-Oai are made in a unique style of photography, which can be considered Asian pictorialism. This method of adapting a Western art for Eastern purposes probably originated in the 1940s in Hong Kong. One of its best known practitioners was the great master Long Chin-San (who died in the 1990s at the age of 104) with whom Don Hong-Oai studied. With the delicate beauty and traditional motifs of Chinese painting (birds, boats, mountains, etc.) in mind, photographers of this school used more than one negative to create a beautiful picture, often using visual allegories. Realism was not a goal. Don Hong-Oai was one of the last photographers to work in this manner. He is also arguably the best. He has won hundreds of awards given by photography societies throughout Asia and by international juries of Kodak and Nikon. BOX has Slight wear on corners and slight discoloration on one side. They book has a few pages in the back with a fingernail size slight indentation. The inscription can be covered with the third grey page. The point has a small white blemish that would be easy for a pro to fix.